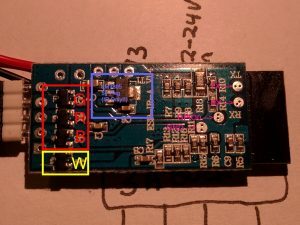 Tl;Dr: You can use these cheap Wifi RGB Modules from AliExpress/Ebay, and with a custom firmware they will speak MQTT and can be updated OTA as well as used for other features as desired. Download a copy of my custom firmware here, connect with the programming pads inÂ the diagram here, configure Arduino to flash to a Generic ESP module with 1M flash (256Kbit SPIFFS) and bob’s your Uncle. The remainder of this post will describe reverse engineering, writing and programming the custom firmware for this module. 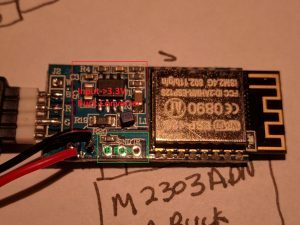 Follow along if your device uses an ESP8266 but differs slightly to my module. As I was searching through my favourite online shop of cheap Chinese electronics, I came across thisÂ item for $5.50 + $2 shipping, which promises Wifi RGB LED control. The price suggests it could be using one of the cheap ESP8266 modules inside as its controller, so I went ahead and bought two. I have an addiction to ESP8266, LEDs and 18650 cells, so this could potentially fulfil two of my three afflictions. When it arrived, I immediately opened it up and was thrilled to see that it was based on an ESP-12S module, and additionally that my version had some extra unused components. It is not uncommon to have different versions of a board layout with certain components not populated; however, the manufacturer has made an error and populated unnecessary components to our benefit. Usually, if a device is destined to lack a feature such as an InfraRed Remote control, then all the components for the IR Receiver are left out. In this case, they have gone ahead and installed a LM7805 5V power supply, and a number of passive components to support the IR Receiver, but not the IR Receiver itself. 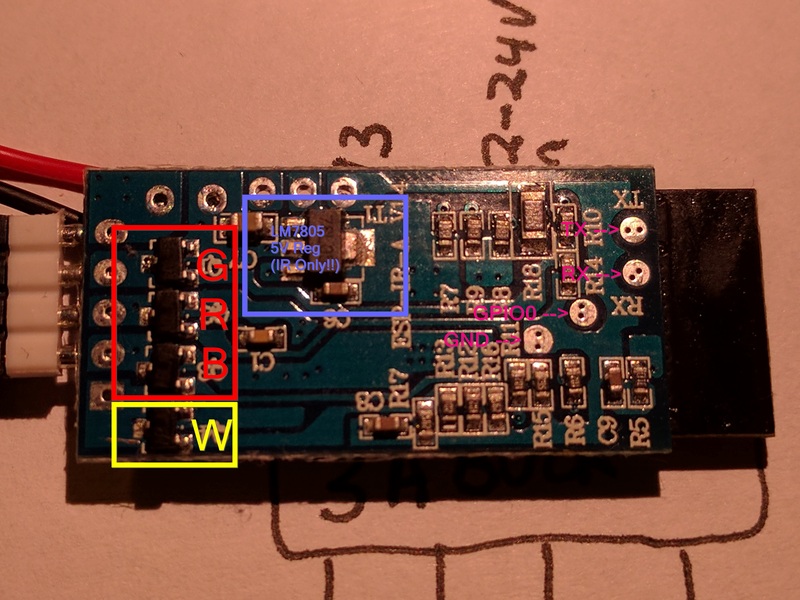 This is great news, because not only does this convert 12-24v down to 3.3V for the ESP module, it also has an unused converter for 5V for any 5V accessories. Similarly, it is an RGB controller and has a four pin connector for RGB strips. Beside the fourth connector there is an unpopulated fifth socket — and behind this socket the MOSFET + all other supporting components for RGBW are populated. This means to convert the RGB-no-infrared model to RGBW with an Infrared remote, you’ll only need a fifth socket pin + IR Receiver module! Great news! Below are pictures identifying the components. If you’re planning on making a customÂ extension, such as a motion detector, it’s best to use the IR and unused* pin first. Hookup TX/RX/GND/GPIO0 accordingly. I hand-hold wires onto the pads, which works most of the time. Upon completion, release GPIO0 and unplug+plugin module to boot cleanly from the flash. 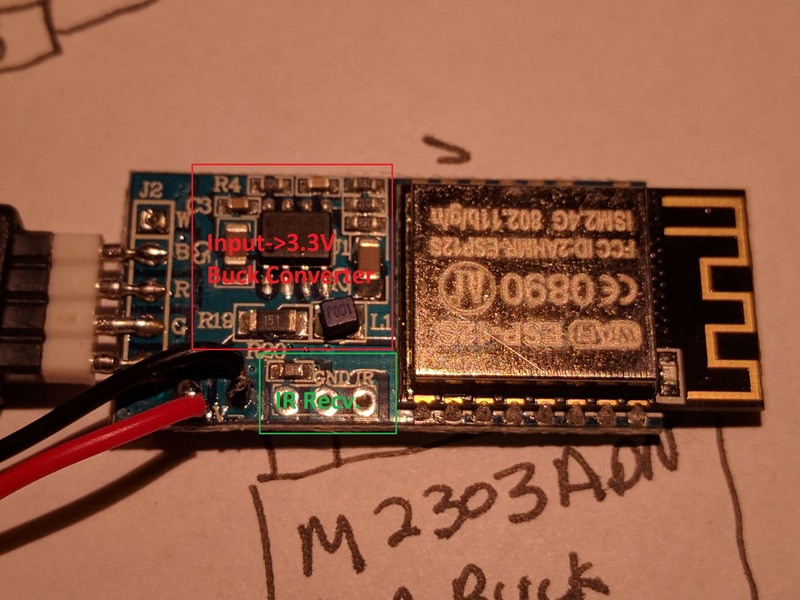 * I haven’t traced around the board to determine if this pin is in fact attached to anything; There is nothing on the board to suggest that it is but I haven’t verified this.